A boy returned from Sunday school and his mother asked him what he had learned. He said that he heard about how Moses and his people escaped from Pharaoh's Egypt. He told her that as Pharaoh's tanks approached the Israelites, Moses got on the radio and called in an air strike, which knocked the tanks out of action. The puzzled mother asked, "Is that really the way the teacher told the story?" The boy replied, "If I told it her way, you'd never believe it!" This joke originally appeared in Reader's Digest around 1967 and it is the opening paragraph of "The Warthog and the Close Air Support Debate". The author of this book quoted the joke to make the point that in popular imagination, close air support is a given. 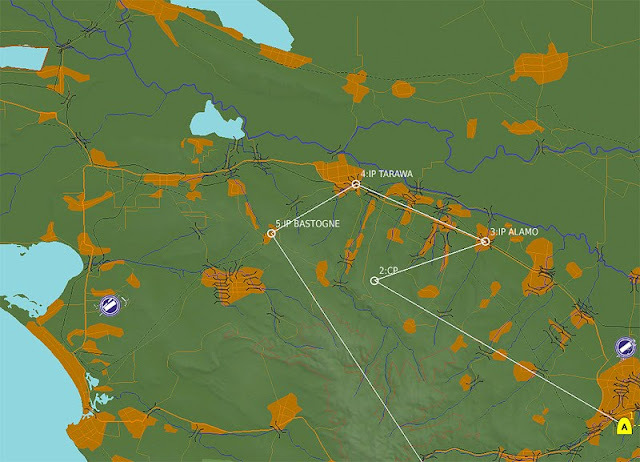 This series of entries are an amateurish attempt to outline how CAS is done in real life by the USAF, using LOMAC Flaming Cliffs 2.0 as a framework. I make no claim of being knowledgeable enough on the topic to provide totally realistic dialogs and comments. Whatever I write here you will find it elsewhere in the web. My only point is that besides the complexity of putting ordnance onto the enemy while flying at 300 knots, in real life there is another layer to it that is quite technical and time-consuming. We are the US Air Force and we love to bomb ... just not near the battle lines! This is what we got today. 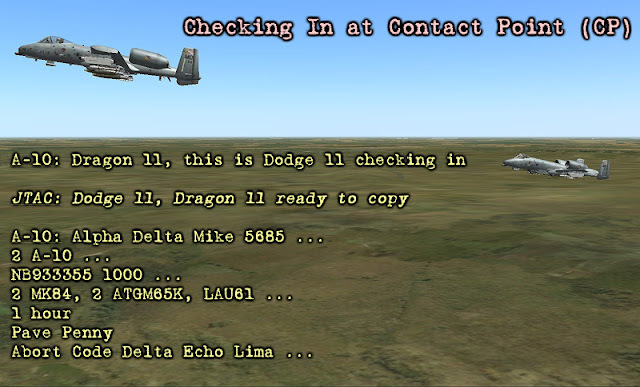 We (a flight of 2 A-10s) have been loitering for a little while before AWACS controllers directed us to a contact point (CP, way point 2 in the map below) and contact Dragon 11. In the map below you will notice the CP (way point 2, WP2) and three other way points. These other three are pre-planned IPs that both us and the ground controllers know about. Since CAS is dictated by the needs of the troops below, we don't know which of the IPs we will use beforehand. But we will find out when we contact Dragon 11 from the CP (WP2). Where are the troops in this map? Well, we only know that a US Army Bn is advancing north west and that they are fighting near IP TARAWA. This map should contain some control measures, but I omitted those for clarity. When we reach the CP, the following check-in chit-chat takes place. Huh? See explanation in the text. JTAC is the joint tactical air controller or more simply put, our ground controller. His callsign is Dragon 11. More coming in the next entry.